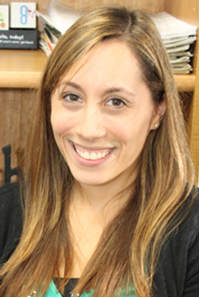 New Digital Media Lab Equipped for Your Creativity! Digital Media Lab: The computer equipment in our Digital Media Lab was upgraded to new high speed computers including iMac 27” 3.2GHz Quad-core Intel Core i5 with 32 GB of RAM running OS X Mavericks. Each iMac has a Wacom Cintiq 13” HD Interactive Pen Tablets partnered with it. 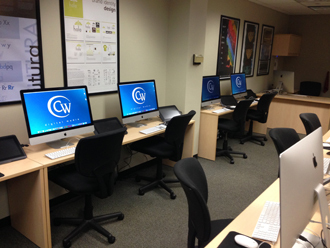 New application software for use in this lab includes the Adobe Creative Cloud suite, and Final Cut Pro X. 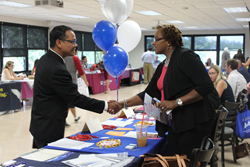 The Office of Career Services held a Graduate Career Fair with 28 employers looking for local talent. Many of the grads filled out applications and had on the spot interviews. Some of the companies that attended the Grad Career Fair included MTA Metro-North Railroad, NYS Dept. of Taxation & Finance, People’s United Bank, and WESTMED Medical Group. Good luck to all attendees, and thanks to all the companies for recruiting at The College of Westchester! 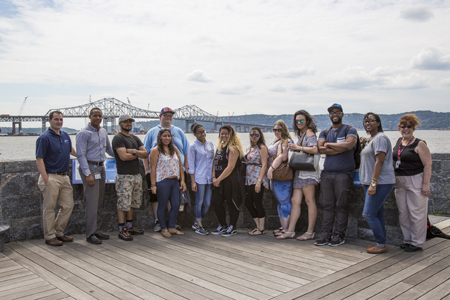 As part of the Project Management Class, Professor Paula Cancro took her class to the Tappan Zee Bridge Community Outreach Center and Viewing Platform in Tarrytown. The purpose of the visit was to understand how the construction of a new bridge can involve so many phases and different teams working on a single project. The first span of the new twin-span bridge is scheduled to open in 2016, and the new bridge should be completed in 2018. 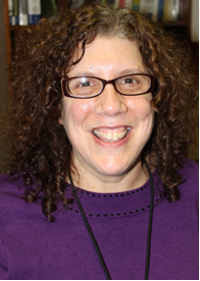 Prof.
Congratulations to Prof. Paula Cancro for successfully completing the Quality Matters course “Improving Your Online Course Facilitator Certification.” As a certified instructor, she can now offer CW faculty an “in-house workshop” to improve their online courses.